Ancient Egyptian women had a more important role in society compared to today’s women in Egypt. They occupied various positions of power in the social and political hierarchy of ancient Egypt and some of them even rose to become the rulers of the kingdom. On a social level, men and women had different roles to play and although the status of women was not considered exactly equal to that of men, they nonetheless enjoyed certain important privileges. This was also in part due to the respect that was accorded to ancient Egyptian women by the prevalent theology and morality of the time. Women could work in various professions, although the most common profession for them was peasantry. If we follow the history of ancient Egyptian women, it becomes evident that they enjoyed better position in society compared to other ancient civilisations. For instance, in ancient Athens women were considered eternal legal minors. In ancient Egypt, however, legal status of women was equal to that of men. This equal status is also reflected in the paintings that have been discovered on tombs and temples where men are almost everywhere accompanied by women. Among various interesting facts of the history of Egyptian women, one is the absence of any records of marriage ceremony. There are records of divorce and other facts related to married life, but there aren’t any records of marriage ceremonies. Various explanations have been given for this phenomenon, one of them being that a couple were considered married once they started living together. 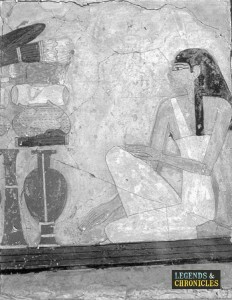 Here an ancient Egyptian women is kneeling while offering up items. Ancient Egyptian women’s role in society was perhaps more important than a women’s role in any other ancient civilisation. They were active on all levels of social hierarchy. For women of lower classes, the most common profession was peasantry to which majority of the population was associated. It was also common for women to manage farms or businesses in the absence of any male member of the family. Egyptian Women from well-to-do families also worked as perfume-makers and were sometimes employed in courts or temples. However, it was more common for women at lower levels of society to work and women from wealthy facilities generally preferred to stay at home. Jobs for women in ancient Egypt were found in various domains of life. 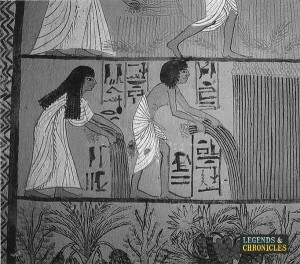 After peasantry, some of the most common professions for ancient Egyptian women included dancing, singing, music, and acrobatics etc. Women from the noble families often became members of priesthood connected to certain temples and in the service of certain gods. There are also examples when women acted as doctors like the lady Peseshet during the Fourth dynasty of ancient Egypt. Other than these professions, women in ancient egypt also played important roles at the highest levels of government. The role of women at high official levels was not rare, and some of them even rose to become pharaohs of their time. Perhaps the most important reason behind this highly respectable role of women in society was religion which held them in high regard. The most common form of women’s clothing was a dress called Kalasiris which simply consisted of sheath dresses. This was the most popular dress throughout the Old, Middle, and the New Kingdom. One or two straps were used to hold the dress which went down to the ankles. The length of the dress of Egyptian women also indicated the social class, with the length being more for women from upper classes. It was also common to use beads or feathers as embellishments on the dress. Shawls, capes, or robes could also be worn over the dress. During the New Kingdom, a robe was used by both men and women which could be draped in various ways. This consisted of two rectangular pieces of cloth sewn together whilst leaving a space for the neck. Egyptian women working in the fields. Considering that women played a very active role in almost all levels of society, names of several famous women have survived history. One of the first women who held the status of a pharaoh was Hatshepsut whose rule started around 1,500BC. Names of various famous women have come down who actively took part in the social life of ancient Egypt. One such woman was lady Nenofer who was the head of a business during the New Kingdom. Another famous Egyptian woman was lady Peseshet who was a doctor during the fourth dynasty of Egypt. But the most famous of all ancient Egyptian women was Cleopatra VII who had a relationship with Roman Caesar and then with his commander Marc Antony. The romance of Cleopatra and Antony was immortalised by Shakespeare in his drama. Ancient Egypt has to its credit had more women rulers than any other ancient civilisation. Many famous Egyptian women served as pharaohs during different dynastic era’s. Among these women, the first one to become a pharaoh was Merneith who belong to the very first dynasty. Subsequently, dozens of women became pharaohs during different dynasties right up to the time of Roman conquest of Egypt. At that time, Cleopatra VIII was the Pharaoh, who was daughter of famous Cleopatra VII and Marc Antony. Equally famous is Nefertari who was the wife of Pharaoh Ramses II. The third most popular women would be Nefertiti who, along with her husband Akhenaten, was responsible for changing the religion of Egypt from polytheism to monotheism. Available historical and archaeological sources make it amply clear that ancient Egyptian women enjoyed very important roles in society. While their roles were naturally not as active as that of men, they could nonetheless take part in all levels of social and political life and could frequently rise to the status of a Pharaoh, which is something not found in other ancient civilisations. This was mainly because of the importance of women in the theology of ancient Egypt as a result of which women could also become priests. Disruption of the ancient Egyptian civilisation and changes during the subsequent times considerably eclipsed the role that women enjoyed in Egypt.